Already underfunded plans to bring high-speed rail service to San Francisco face a new $1.5 billion shortfall, which San Francisco officials say is due to cost cutting by the cash-strapped California High-Speed Rail Authority. That funding was crucial not only to link the state’s high-speed rail project with San Francisco, but to fund the 1.3-mile rail connection between the Caltrain station at Fourth and King streets and the under-construction Transbay Transit Center. The transit center is already struggling with cost overruns and a transition in leadership. The Transbay Transit Center, a 1 million-square-foot South of Market regional transportation hub is slated for completion by late 2017, but critics have said it will be a billion-dollar bus terminal if the extension to Caltrain and the bullet train doesn’t get built. The $1.5 billion shortfall could further imperil the extension. The huge drop in the amount of money the city is expecting to receive from the California rail agency is spelled out in an April 13 letter to the high-speed rail authority from the heads of several San Francisco agencies. The letter says the city’s Transbay Transit Center’s funding from the High-Speed Rail Authority “will be reduced by $1.5 billion to $550 million,” citing the authority’s recently revised draft 2016 business plan. The San Francisco officials called the rail agency funding “an integral part” of financing the planned Caltrain/high-speed rail extension to the new transit hub. The missive, obtained by the Business Times, asks the rail authority to reinstate the funding and make San Francisco, instead of San Jose, the terminus of its initial bullet-train tracks. A revised plan, announced at a California High-Speed Rail Authority board meeting last week, indicated that the first $21 billion operating segment of the planned system would link San Jose to the Central Valley by 2025, rather than connecting Southern California to the state’s midsection. Design decisions made decades ago at the origin of BART now haunt the system, making it more difficult and more costly to operate, officials with the transit agency say. Designed at the beginning of the Space Age, the people who built BART wanted an ultramodern transportation system. The first transit system to be built after World War II, the goal was to create a sleek, light and smooth riding system. The hope was to draw people back into public transit – using large, tinted windows, wool seats and carpeting and promising speeds of up to 80 mph. Luxury may have been built in, but the idea of routine failure was not, said BART Operations Manager Paul Oversier. “Because in the aerospace business failure equals catastrophe well in our business failure is a fact of life,” he said. Oversier, who came to BART after helping to run the New York subway system, said that system has a whole different approach. It was built to handle failure. Not having such switches is most problematic in the core part of the system, from West Oakland to Daly City. Here, four lines with trains running every two and half minutes converge to run in one track in each direction. “Basically, if anything happens in that core part of the system,” Oversier said, “the delays to our passengers ad to other trains propagate very quickly and impact many, many trains.”. The bottleneck was something the designers did not anticipate, one of many design limitations that now hamstring operators. “A lot of decisions made 50 years ago about this system really limit what we can do today,” said Tom Radulovich, a 19-year member of the BART governing board. The use of ultra- lightweight aluminum cars gliding along on extra-wide gauge tracks at up to 80 mph, he said, had unforeseen consequences. “We couldn’t order off-the-shelf rail cars – they had to be custom designed, we had to have them custom made,” he said, referring to the latest order of new train cars expected to come on line as soon as next year. He said the new cars cost nearly double the price of more conventional rail cars, which are made of stainless steel and can be mass produced. 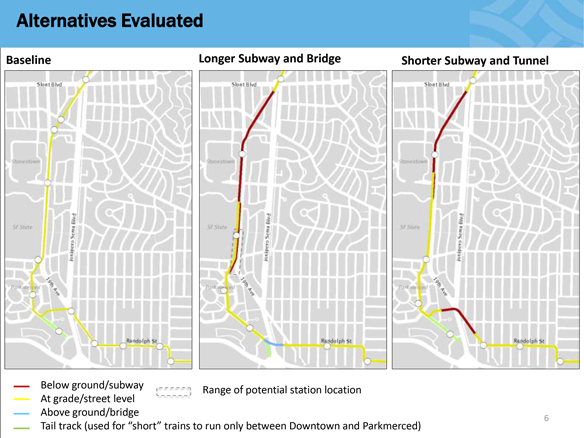 Where the new alignment fails in its analysis is that it ends the M streetcar at Parkmerced, where a J streetcar receives passengers moving into the Oceanview district. The opportunity for less service into Oceanview is likely since it is not a well-connected neighborhood. Both the old and new M streetcar alignments avoid a stop at the Senior Center located at the Temple Methodist Church. It is inappropriate to foster a care facility in San Francisco, have the public depend on that center’s care, then abandon the center by no longer providing public transportation for seniors and the disabled. Presently there is a stop at Beverly Street where the senior center is located. Service to this center should be demanded by the neighborhood. Additionally, the stop at the existing Lakeside business districts is considered optional. The elimination of this stop could have a dramatic effect on the existing businesses there. Most important, the J streetcar traveling downtown could just change its sign from J to M at the Parkmerced station instead of having passengers leave the streetcar and find new seating on the M streetcar. In returning home, if this same procedure could occur, it would improve J ridership dramatically. The Parkmerced project was always been about providing more market rate housing for the City tax coffers. This plan to treat J streetcar riders as second class citizens needs to be brought to the attention of the City and SFMTA. In my opinion, this underground solution was necessary because the 18,000 new residents of Parkmerced would appear to be poorly served by the transportation provided by the past plan. The past plan had no solution for the St. Francis Circle congestion, which would be both difficult for traffic and the M and K streetcars alike. In the old plan, there was only one track going each way, this new design has two. With only one track in the old plan, this could lead to lines of streetcars going downtown, one after the other. The first car picking up passengers and the second one trailing behind empty. Then, the elevated track over the Junipero Serra/19th Ave. exchange would have had numerous failings. First, the noise created in an elevated platform would have been hard to ameliorate, causing blight in at least two nearby Towers by the noisy streetcar regularly passing by. Today, the plan is to have the streetcar land on the narrow part of Randolph Street (39′-6″ wide). This would leave 11′-6″ for two rows of parking and for two lanes of cars to pass each other, obviously, not nearly enough space for either activity. Therefore, the plan with the ramp ending at 19th Avenue, near Randolph St., is the preferred plan between these two. Other hardships the Oceanview neighborhood has endured in the past has been Highway 280 providing an impassable barrier along its southern border. The entrances into the neighborhood have been minimized by traffic engineers more interested in traffic flow than economic opportunity for the residents. Many parts of the Oceanview neighborhood were designed with super blocks that are 3 to 4 times larger than regular blocks in San Francisco. These giant blocks, popular in the early part of the 1920’s, minimize an opportunity for commerce by having fewer intersections. Typically, family and other businesses occur at street corners. Super blocks have been abandoned by City planners today. The Oceanview district does not need another obstacle to its success like a separate J streetcar line. 1.